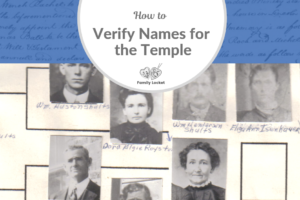 When you have completed the entire process of finding names for the temple, you will probably, at some point, want to find more names. The next time you do the process, it will be easier, because you have already made a list of ancestors to research! If you are working with a full tree and doing descendancy research, go back to your “List of Ancestors for Descendancy Research.” Select another one of the candidates for further research you identified in step 3 and repeat the research process in step 4. 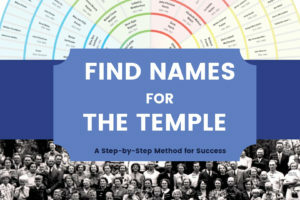 To view all the articles detailing each step, click here: Find Names for the Temple Articles. When it’s time to choose a new research question, you might want to choose a question that focuses on the same person. Maybe you found their spouse and now you want to find their children. Be sure to update your research objective with any new identifiers you have found. Before you start, reread your last research report or notes. From those notes, you may have ideas for what to do next. An important part of professional genealogy research is including a list of future research suggestions in the report. This allows you to pick up your research right where you left off, even if you come back several weeks or months later. If you found the parents of an ancestor in your last project, you may now want to search for their marriage date in your next project. As you become proficient using the research method in Chapter Four, you may decide to take on a challenging project to prove a relationship in the more distant past. Maybe one of your 5th great grandparents in New England has no parents. Find out what records are available for that time and place and make a research plan. Search the records and see what you can find. Remember that any time spent researching is not wasted if you keep a research log and write a summary of what you learned, even if you found nothing. If you are doing descendancy research, and your previous research question focused on one of the children of a large family, you may now want to turn your attention to one of the other children in the family. Eventually, you can research all the children in the family and find all the grandchildren of a particular ancestral couple. Next, you can find all their great-grandchildren. Generally, in each generation, the number of descendants increases. In my list below, I have crossed of Pearce Bradley, since I finished the project to identify his children. Now I am ready to move on to George Gregory, the next candidate I identified in the list of descendants of Mary Powderill Bradley. When I finish those projects, I can move to a different descendancy tree – possibly Thomas Hugget and Jane Comber. There are 50+ targets in the puzzilla tree for them and I know I could find several names for the temple there. After you have completed researching all the descendants of the ancestors in your list, you are ready to go back one more generation. 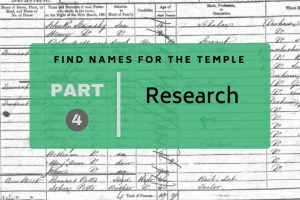 Create a new list of ancestors as starting points for descendancy research with the parents of the ancestors in your previous list. Remember that the connection between you and the ancestor should be reviewed for accuracy before embarking on descendancy research. You may need to do a research project to prove the relationship between an ancestor and his or her parents before you can proceed with descendancy research for that generation. As you complete several projects in the same locality, you may want to save the information you’re finding about the history, geography, and available records for a particular county, state, or country. Consider creating a locality guide to keep track of all the places online and offline that you have used to find information, maps, record collections, and other resources. Learn more about how to create a locality guide here.